A root canal is a treatment to repair and save a badly damaged or infected tooth. The procedure involves removing the damaged area of the tooth (the pulp), cleaning and disinfecting it and then filling and sealing it. As stated above, the common causes affecting the pulp are a cracked tooth, a deep cavity, repeated dental treatment to the tooth or trauma. The term "root canal" comes from cleaning of the canal inside the tooth's root. Ask your veterinarian about a referral for root canal therapy. Most animals dentists charge the same fee for an extraction as they do for a root canal. No root canal can be performed until the patient has dental x-rays under general inhalation anesthesia. If there is root resorption from long term endodontic disease; complex root fractures; or calcified canals; a root canal may not be a referenced choice of treatment. It is important to remember that endodontic dental x-rays must be taken with the patient under general inhalation anesthesia. No patient should ever have a root canal without pre-root canal dental x-rays; intraoperative dental x-rays; and follow-up dental x-rays in 6-12 months post-endodontic care. The diagnostics and the procedure are always performed at the same time. If not going to an animal dentist for a root canal please ask the general practitioner about their training in root canal therapy and how many root canals they have performed in that training period. Human dentists many times assist general practitioners in the root canal treamtment of pets. If this is the case, please meet the human dentist and find out their experience in animal endodontics. 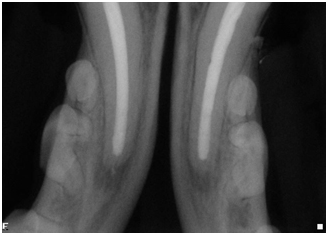 Again, no individual should be performing endodontics in animals without the availability of digital oral radiology. Everyone wants a bright smile. Don’t waste your time and hard-earned money on teeth whitening products that don’t work. Braces work by gently and gradually straightening your teeth by applying a constant force on the teeth to move them.